Yet again there’s a new study out on vaping, and as usual it’s stuffed full of scary words like diacetyl. However a closer look suggests that the researchers have found little that’s new and nothing that’s scary. 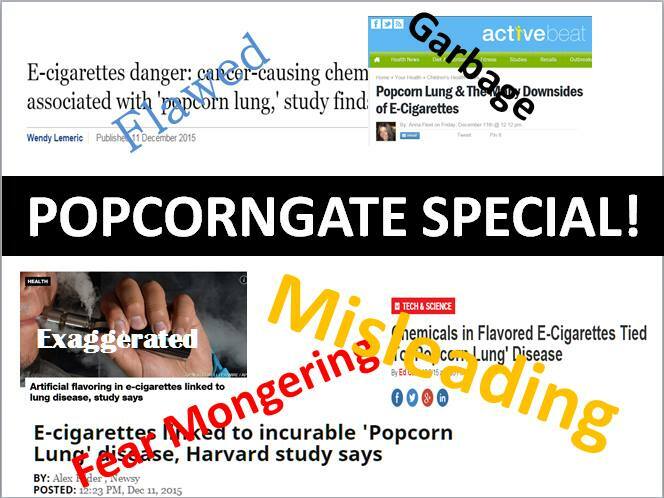 So diacetyl is back in the news again, with a new paper from a group of researchers at Harvard University. This one claims that the flavouring is found in 75% of all e-liquids, not just the creamy flavours it’s usually associated with. Predictably the usual suspects in the media are all over it…. Today, film director Aaron Biebert presented a speech to the White House’s Office of Management and Budget. In it he issued an eloquent plea for President Obama to ensure that upcoming FDA regulations on electronic cigarettes don’t wipe out the industry and leave what survives in the hands of the tobacco companies…. Sitting on Highway 71 in Missouri is a factory producing microwavable popcorn. The factory used a flavour called Diacetyl to produce its popcorn – and, according to one of its employees, Eric Peoples, it did so at three times the usual levels. In the late 1990’s, workers at the factory, including Eric Peoples, began to get ill. Initially they thought it was just a cold or asthma. But then one worker after another was diagnosed with a rare disease called bronchiolitis obliterans – now commonly known as popcorn lung…. A recent study conducted by researchers at the T.H. Chan School of Public Health (part of Harvard University) examined levels of three flavouring compounds in refills and liquids for e-cigs. A Harvard study claiming most e-cigarette brands expose users to harmful chemicals omits critical information and exaggerates the risks of flavored e-cigarettes, according to tobacco control experts. The recent study on electronic cigarette flavorings by Harvard University has taken over social media. The Harvard article alone has over 250,000 shares on Facebook alone, that doesn’t include the hundreds of thousands of shares that were accumulated between different news sources that covered this article. If one in every ten users shared that article, that means over 3.5 million plus people (more than likely much higher) have seen the released study…. Mr. Zerden later discovered something by searching online that he began sharing with his classmates. The professor was not only a full-time member of the Harvard Medical faculty, but a paid consultant to 10 drug companies, including five makers of cholesterol treatments…. Professor Dame Sally Davies is the Chief Medical Officer for England, the most senior medical advisor to the Government in the UK, equivalent to the Surgeon General in the USA. Under the auspices of this role, she is a member of the Board of the NHS, a civil servant in the Department of Health, and head of the medical civil service…. This vaping video is ILLEGAL! 7 Pings/Trackbacks for "A Bucket Full of Popcorn"